Our NEW white paper introduces PMI's Eclipse - ideal for DER control & management! 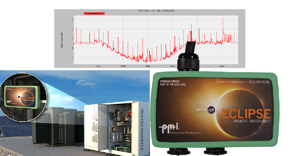 The Eclipse provides the ability to control remote equipment in the form of a DER inverter. DER refers to Distributed Energy Resources and is used to describe various decentralized sources of power generation and energy storage systems. Examples include solar arrays, wind farms, backup generators and batteries. These types of resources are now being integrated into the management of the grid to better accommodate peak demand. The DER sources of power are typically DC voltage utilizing an inverter to create the required AC power. The Eclipse can be used to remotely control the inverter and monitor its output. It is best used for small to mid-sized DER implementations up to the 1,000 kW range.